If you are visiting Kansas City during the holiday season and want to get a photo taken with Santa Claus, there are a slew of places St. Nicholas is making an appearance. Starting in November, Santa Claus is coming to town, and you and your children have the opportunity to visit him at his North Pole outposts across the region, from shopping centers and lighting display villages to farmer's markets and locomotives. Santa Claus arrives at many of the malls in the Kansas City area during the Christmas season starting around the first of November and staying through Christmas Eve. Each mall offers custom photo packages at various price points to provide parents with a memory to take home. Crown Center invites children to grab a snap with Santa and then head over to the interactive Gingerbread Station for tasty homebuilding and a ride on the Crown Center Express Train Engine. Songs of the season ring through the stores with 120 area school and community choirs performing daily until right before Christmas. The Oak Park Mall's lower level is transformed into Santa's Workshop starting in late November and continuing through the Christmas Eve—visit the website to buy a Santa Fast Pass online and skip to the head of the line to grab your family photo. At Zona Rosa, each child receives a free gift from Santa after visiting, and the mall sets aside a day for "Sensitive Santa," which is a photo op for children with sensory sensitivities set in a soothing environment. Reindeer aren't the only pets welcome at this mall. On select dates, the family pets are allowed to join for a picture. 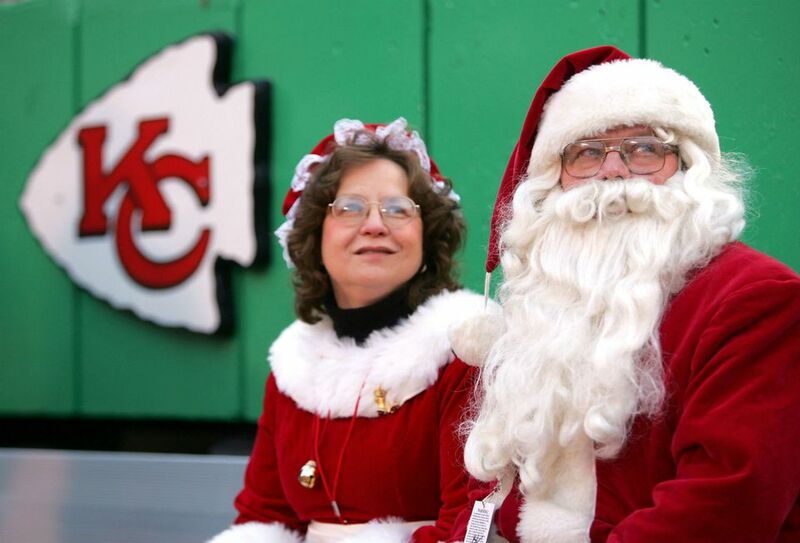 Santa, Mrs. Claus, and all the elves are quite busy during the holidays in Kansas City appearing all around the city at a variety of special events. In late November (and every Saturday until Christmas), Santa Claus visits the Downtown Lee's Summit Farmer's Market. You can also catch old Saint Nick hanging out at the annual Holiday Lights on Farmstead Lane, which runs daily until the first week of January. The Kansas City Zoo hosts a few special events of its own including the Winter Wonderland and popular Santa Dives, where Santa Claus dons a scuba suit on top of his traditional red and white outfit and plays with penguins in the Helzberg Penguin Plaza. Hop on the Belton Railroad's Christmas train to join Santa for short ride on the tracks and hot chocolate and a cookie for each passenger. Why not take a drive along Santa's Wonderland? These Christmas parks feature thousands of lights that families can cruise through while keeping warm inside the car before stopping off in a village devoted to Mister and Missus Claus.